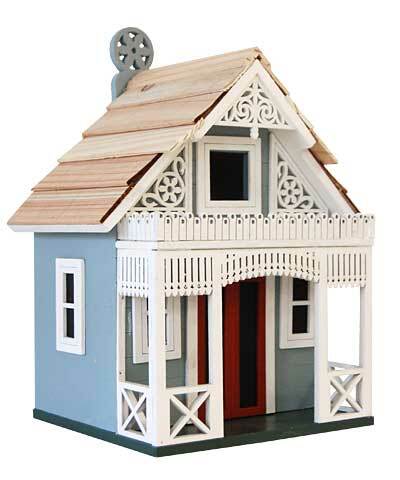 Bring heavenly style to the forefront of your bird garden with this Home Bazaar Angel Cottage Bird House. Brilliant details throughout this realistic shelter create an ornate garden centerpiece, while its wooden body enhances your setting. White trim, fencing, porch columns, and rails create a remarkable piece, and red accents on the faux door offer a bit of contrast. The green base evokes a lawn, and the soft blue of the house celebrates the sky. A 1.125", square opening sits near the top of the home, enabling small birds to enter the piece. This leads to a generous interior nesting chamber, with a drainage hole in the center for a dry roost. Ventilation gaps beneath the two longer sides of the roof aid in regulating the internal temperature, furthered by the all wood body. A decorative hanging tab swings upward for placing the home against a wall or tree trunk, or the flat base can attach to a post or pole using a mounting bracket (not included). The blue body of the house helps keep the white trim visible, and the lapped roof protects the interior from the elements. Befriend a few birds by placing this lovely Angel Cottage Bird House in your yard.